Twinkle light switch which is also often called the flasher, usually use fluorescent lamp starter. But fluorescent starter has irregular twinkle and often do not twinkle at all. Flasher discussed here can be used with 220 VAC and lamp power ranging from 5 watts to 200 watts. As we can see in the above video, the flasher is being tested with 2 (two) 100-watt lamps, so the total power is 200 watts or equal to 40 of 5 watt bulbs commonly used as decorative lighting. 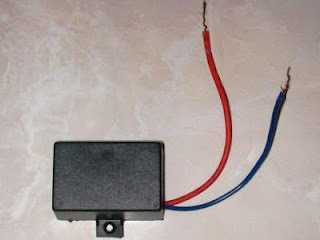 This flasher is a very efficient switch and consume power less than 0.2 watts for itself to operate. The wiring connection is very simple. 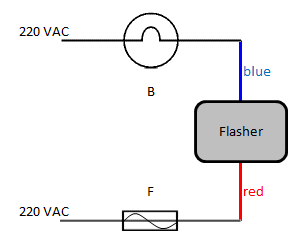 The blue wire from the flasher is connected to the twinkle bulb (B), another wire from the bulb is connected to the power grid. Red wire from the flasher is connected to a fuse (F) with a maximum size of 1 ampere, and the fuse is connected to the power grid. This way the flasher is protected from large currents directly from the grid, and ensure the best performance. Twinkling light can be adjusted. This flasher is suitable for twinkling lights for celebration, party, Christmas, New Year, decorative lighting for store, restaurant, entertainment, and others. 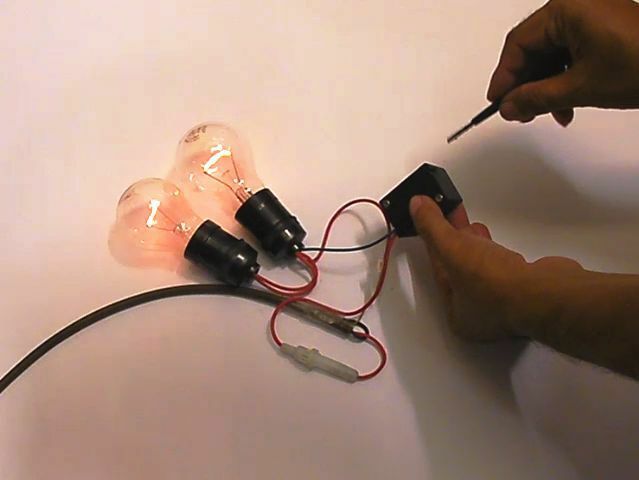 For comparison, the following video using fluorescent light starter as a flasher. Photo below shows a twinkle light switch that is packaged in a box, for the circuit schematic can be read in the article: Adjustable Twinkle Light 200 Watts 220 VAC Schematic.